Wonderful opportunity in Pinecrest. Updated 4 bedroom + office/den and 3 baths with inviting pool/patio ideal for outdoor dining and entertaining on sprawling fenced corner lot, 2 car garage & ample parking around circular and side parking driveways. 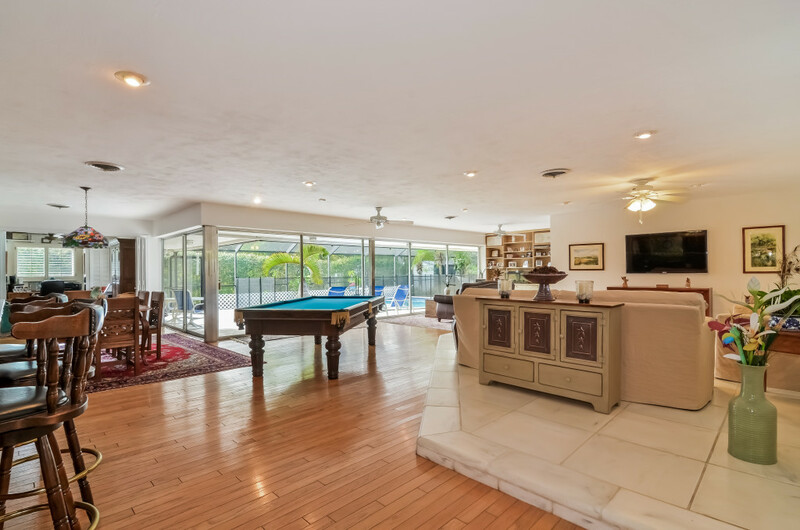 Flexible open floor plan has great room effect with elevated living room, family room, dining room–all overlooking tropical outdoors and pool area w/basketball court. New custom wood/granite/stainless kitchen with huge eat-in area and built-in pantry & wine refrigerator. Walk or bike to nearby schools: Howard Drive Elementary, Palmetto Middle & Palmetto Sr. High. Many impressive details and finishes. Easy appointments and a pleasure to show through listing agent, Suzanne Anderson, 305.281.8100. This entry was posted on Wednesday, March 18th, 2015 at 9:42 PM and is filed under City News, Market Trends. You can follow any responses to this entry through the RSS 2.0 feed. Responses are currently closed, but you can trackback from your own site.